When you wake up this Valentine’s Day, chances are you’ll want to do something special with breakfast for your loved one. Going the extra mile and serving these up to your sweetheart, is sure to score you lots of points on this love-filled morning. Here’s a cute twist on the classic pancake stack! When you add just a few drops of red food coloring to half your batter, you can give your pancakes a whole lot of heart. It will only take you a few moments longer than your usual pancake routine, which we think is time well spent. After all, when your day starts out with romance, it’s sure to be a good one. Split your pancake batter in two, and add 3-4 drops of red food coloring to one half. 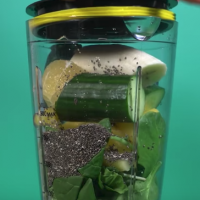 Mix it well to incorporate the color. If you’d like it more red, add a few more drops. Make the pancakes according to the recipes instructions. Make an equal amount of red and plain pancakes. Lay your pancakes on a cutting board, and cut out the centers of the pancakes with the cookie cutter. 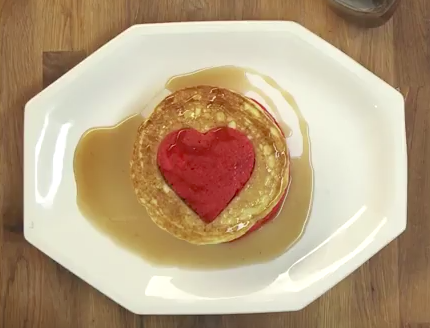 Place the red heart cut-outs in the plain pancakes, and the plain hearts in the red pancakes. Stack your pancakes and enjoy!